Bring the kids along to Sea World Theme Park and Warner Bros. Movie World. You'll find plenty of places to visit near Gold Coast: Byron Bay (Lone Goat Gallery & Cape Byron Lighthouse) and Moffat Beach (in Caloundra). Next up on the itinerary: cool off at Dreamworld, explore the striking landscape of Burleigh Head National Park, take in panoramic vistas at SkyPoint Observation Deck, and enjoy the sand and surf at Surfer's Paradise Beach. To find reviews, ratings, more things to do, and other tourist information, read Gold Coast holiday planner . If you are flying in from Singapore, the closest major airports are Brisbane International Airport and Gold Coast Airport. 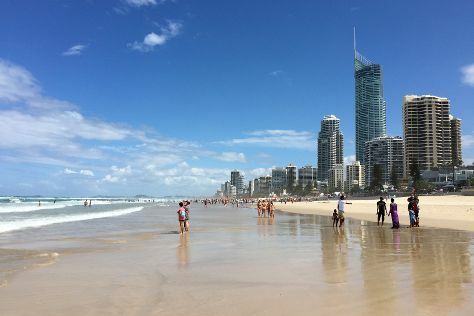 In March, daytime highs in Gold Coast are 32°C, while nighttime lows are 23°C. Finish your sightseeing early on the 22nd (Fri) so you can travel back home.